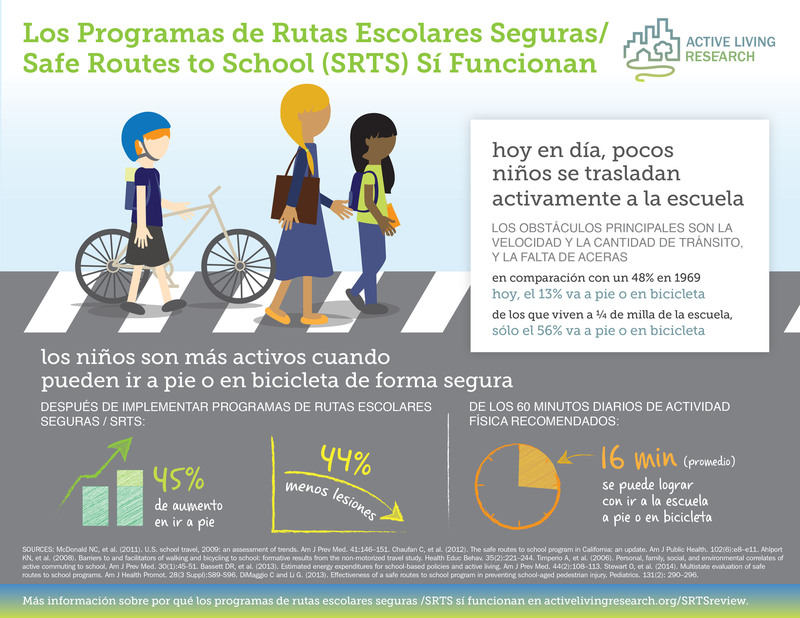 Our popular Safe Routes to School Programs Work infographic has now been translated into Spanish. Most school children in the U.S. get to school by bus or car, with only a small percentage walking or biking. In 2005, Congress created the Safe Routes to School (SRTS) program to improve safety and increase the number of children walking and biking to and from school through educational efforts, encouragement programs, and road improvements at or near schools. Research studies indicate that SRTS has increased rates of walking and biking and improved safety. Studies also show the program is an economically sound investment that can decrease health costs and school transport costs. This infographic features evidence on the barriers of walking and biking to school and the positive impacts of SRTS programs on physical activity levels and safety. Findings presented in this infographic come from a related ALR research review. You can download the infographic in JPG format (783 KB) by clicking on the image above or the "Download Original" link at the bottom of this page. A high resolution PDF version (2 MB) is also available upon request. When requesting, please let us know how you intend to use the infographic.